The Boeing 737 arguably is the most successful twin engine narrow body airliner of all time has recently celebrated its 46th birthday. The first Boeing 737 was test flown early in 1967, a year later in 1968 the 737-100 entered service in and a legend was born. Preliminary design on the 737 began in May 1964; Boeing Management had undertaken an extensive market research program and came to the conclusion that a short-haul jet was needed to supplement the 727 on all the short routes. The 737-100 was designed to carry 50 to 60 passengers on relatively short routes up to 1700km. The 737 program was immediately under pressure with rival manufactures also developing aircraft for similar applications. The BAC-111, Douglas DC9 and Fokker F28 were all way ahead of the development race and were very close to flight certifications. In an attempt to speed up development a decision was made to use approximately 60% of the structure and systems from the 727. The use of the 727 fuselage cross section proved to be brilliant, as the 727 cabin could seat six abreast, whereas the BAC-111, DC9 and F28 all seated five. Boeing engineers decide to mount the motors directly to the underside of the wings thus allowing for shorter undercarriage legs and also kept the motors close to the ground making ramp inspection much easier and economical thus keeping down the overall running cost of the aircraft. The engine chosen was the Pratt & Whitney JT8D-1 low-bypass ratio turbofan engine. The first of six prototypes rolled off the production line in December 1966 and made its maiden flight on April 9, 1967, piloted by test pilots Brien Wygle and Lew Wallick. On the 15th December 1967 the Boeing 737-100 was certified for commercial flight by the Federal Aviation Administrator and was the first aircraft approved for (Category II) Instrument Approaches. Lufthansa placed an order for 21 B737-100's on the 19 February 1965 and received their first aircraft on the 28th December 1968, making them the first non-American Airline to launch the new Boeing aircraft. The Boeing 737-100 only saw limited service with Lufthansa as work was already underway on the B737-200 and only 30 100's were ever built. The 737-200 was slightly longer both forward off (91cm) and behind (102cm) the wings, this increased the number of passengers to 100. United Airlines placed an order for 40 B737-200's the first of which flew its maiden flight in August 1967. Development began in 1979 for the 737's first major revision. Boeing wanted to increase capacity and range, incorporating improvements to upgrade the aircraft to modern specifications, while also retaining commonality with previous 737 variants. In 1980, preliminary aircraft specifications of the variant, dubbed 737-300 were released at the Famborough Airshow. The lager CFM56-3B-1 high-bypass turbofan engines were chosen to replace the fairly narrow cigar shape Pratt & Whitney engines. This posed a problem as the height of the wing from the ground was not sufficient to house the lager diameter motor. Boeing and engine supplier CFMI solved the problem by placing the engine ahead of the wing and by moving engine accessories to the sides of the engine pod gave the engine a distinctive non-circular "hamster pouch " air intake. The distinctive non-circular "hamster pouch" air intake. The passenger capacity of the aircraft was increased to 149 by extending the fuselage around the wing by 2.87 meters. The wing incorporated a number of changes for improved aerodynamics. The wingtip was extended 23 centimetres and the wingspan by 53 centimetres. The leading-edge slats and trailing-edge flaps were adjusted. The tailfin was redesigned, the flight deck was improved with the optional EFIS (Electronic Flight Instrumentation System) and the passenger cabin incorporated improvements similar to those developed on the Boeing 757. The prototype 300, the 1,001st 737 built, first flew on 24 February 1984 with pilot Jim McRoberts. It and two production aircraft flew a nine-month-long certification program. In June 1986, Boeing announced the development of the 737-400, which stretched the fuselage a further 3.0 meter, increasing the passenger load to 170. The 400s first flight was on 19 February 1988 and after a seven-month/500-hour flight-testing run, entered service with Piedmont Airlines that October. The -500 series was offered as a modern and direct replacement of the 737-200. It incorporated the improvements of the 737 Classic series, allowing longer routes with fewer passengers to be more economical than with the 737-300. The fuselage length of the -500 is 48 cm longer than the 737-200, accommodating up to 132 passengers depending of the chosen configuration. A choice of glass and older-style analogue cockpits arrangements was available. Using the CFM56-3 engine also gave a 25% increase in fuel efficiency over the older -200s P&W engines and also vastly reduced the operating maintenance costs. The versatility of the 737-500 quickly made it a favourite of many airlines across the world. Many Russian airlines started buying any second-hand 737-500 that came available to replace their fleet of aging Soviet built aircraft. In the early 1990's Boeing announced the development of the "Next Generation" of 737's. Airbus had just launched their modern A320 range and Boeings wide customer base was shrinking. The -600, 700, 800 and nine hundred series were designed to rectify this. The performance of the 737NG was that of a new aircraft, but important commonality is retained from previous 737 models. The wing was redesigned with a new airfoil section, greater chord , and increased wing span by 4.9 m and area by 25%, which increased total fuel capacity by 30%. New, quieter, more fuel-efficient CFM56-7B engines were used. The wing, engine, and fuel capacity improvements combined increase the 737's range by 900 nautical miles to over 3,000 nautical miles (5,600 km) now permitting transcontinental service. With the increased fuel capacity, higher maximum takeoff weight (MTOW) specifications are offered. The 737NG included redesigned vertical stabilizers, and winglets were available on most models. The flight deck was upgraded with modern avionics, and passenger cabin improvements similar to those on the Boeing 777 including more curved surfaces and larger overhead bins than previous-generation 737s. The first NG to roll out was a 737-700, on 8 December 8. 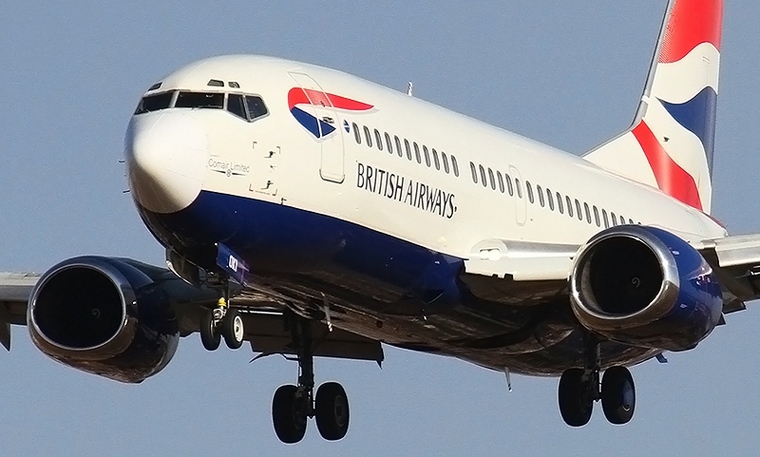 This aircraft, the 2,843rd 737 built, first flew on 9 February 1997. The prototype -800 rolled out on 30 June 1997 and first flew on 31 July 1997. In January 1998 the smallest of all the new variants the 737-600 took to the air and was certified in August of the same year. Throughout the development of the 737NG series, Boeing spent time with all prospective clients in an attempt to ascertain the market needs and come up with a range of aircraft to cater for all the requirements. In 2004, Boeing offered a Short Field Performance package in response to the needs of Gol Transportes A�reos , which frequently operates from restricted airports. The enhancements improve takeoff and landing performance. The optional package is available for the 737NG models and standard equipment for the 737-900ER. The CFM56-7B Evolution nacelle began testing in August 2009 to be used on the new 737 PIP (Performance Improvement Package) which entered service in mid-2011. This new improvement is said to shaved at least 1% off overall drag and have some weight benefits. Overall, it is claimed to have a 2% improvement on fuel burn on longer stages. The Boeing Business Jet is a customized version of the 737. Plans for a business jet version of the 737 are not new. In the late 1980s, Boeing marketed the 77-33 jet, a business jet version of the 737-300. The name was short-lived. After the introduction of the next generation series, Boeing introduced the Boeing Business Jet (BBJ) series. The BBJ1 was similar in dimensions to the 737-700 but had additional features, including stronger wings and landing gear from the 737-800 and had increased range (through the use of extra fuel tanks) over the other 737 models. The first BBJ rolled out on August 11, 1998 and flew for the first time on September 4. On 11 October 1999 Boeing launched the BBJ2. Based on the 737-800 It is 5.84 meters longer than the BBJ with 25% more cabin space and twice the baggage space, but has slightly reduced range. It is also fitted with auxiliary belly fuel tanks and winglets. The first BBJ2 was delivered on 28 February 2001. Boeing's BBJ3 is based on the 737-900ER. The BBJ3 has 104 m2 of floor space, 35% more interior space, and 89% more luggage space than the BBJ2. It has an auxiliary fuel system, giving it a range of up to 4,725 nautical miles (8,751 km), and a Head-up display . Boeing completed the first example in August, 2008. This aircraft's cabin is pressurized to a simulated 6,500ft altitude. As a result of these upgrades the BBJ has become the aircraft of choice for many governments' presidential aircraft around the world these include Australia, Chile, Colombia, India, Iran, Kazakhstan, Kyrgyzstan, Mexico, Mongolia, Nigeria, Peru, South Africa, Saudi Arabia, South Korea, Taiwan, Thailand, Tunisia and Turkey. The Boeing 737 Classics and the Boeing 737 Next Generation main competitor is the Airbus A320 family introduced in 1988, which was developed to compete also with the McDonnell Douglas MD-80/90 series and the Boeing 717. As of November 2013, a total of 329 aviation accidents and incidents involving all 737 aircraft have occurred, including 154 hull-loss accidents resulting in a total of 4,287 fatalities. The 737 has also been in 111 hijackings involving 325 fatalities. This may sound excessive but considering at any given time there are at least 1500 737's airborne and there is one landing or taking-off of every 5 seconds, the 329 accidents over 46 years is not a bad record at all.